Although Jupiter is thought of as a seaside town, the real beachfront town is Juno Beach just 5 miles to the south. Here, the real “beach lovers” gather because here the condos and townhouses are located right on the wide and free beach. 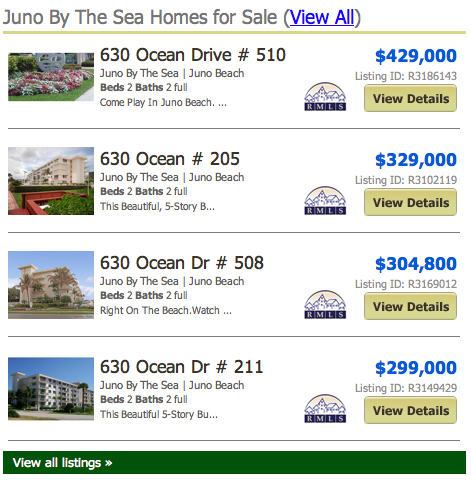 Juno by the Sea Real Estate & Condos Listings & Sold Statistics! Juno Beach is also home to the famous Juno Pier and the Loggerhead Marinelife Center where rescued sea turtles are rehabilitated and returned to the sea. And here in Juno Beach we find the condos of Juno by the Sea. 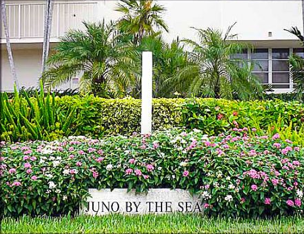 As the famous Beach Road makes its way south from Jupiter to Juno Beach, all the condos are located across the street from the beach until you get to Juno. Here, Celestial Way swings out east and the condos here are situated right on the beach. These condos feature two bedrooms and two baths with about 1,250 square feet of living space. The building has an east-west orientation but is closer to the ocean than any other along this stretch of road so the views are up and down the beach. Amenities include a community pool and access to the beach. The Jupiter Inlet with its famous Lighthouse is about 5 minutes to the north and here on the water you will find some great places to eat while the 150 year old Lighthouse beacon sweeps the area. And the Maltz Dinner Theater offers plays and other performances. South of Juno Beach and Juno by the Sea real estate, is Palm Beach Gardens with its famous golf, shopping and dining along the Intracoastal Waterway. The Gardens Mall, Downtown at the Gardens and Legacy Place offer everything from Saks and Nordstrom’s to big box electronics stores. And along the water are more great dining spots like The River House and the Waterway Café. Posted in Juno by the Sea on May 25, 2011 at 12:39 pm.